As a gymnastics judge, I can tell you that there are a couple easy tips for improving your gymnastics score. Along with these tips, you might want to read up on common deductions for compulsory and optional routines. Keep your legs straight and point your toes.– During your routine, each time you bend your legs on a skill that requires straight legs, up to .3 will be deducted from your score. Each skill performed with flexed feet earns you a .05 deduction. These deductions add up, so keeping your legs straight and toes pointed is important! Keep your arms straight.– This tip is important on bars. Each time you perform a skill on bars with bent arms, up to .3 can be deducted. If you perform 8 bar skills with bent arms that is 2.4 points that can be deducted! Don’t fall.– This tip is important on beam. Each time you fall there is a .5 deduction. If you fall twice in a beam routine your score is reduced by 1 point! Practice staying on the beam during your routine to improve your score. Stick your landing.– This tip is important on vault, bars and beam. For every step you take after you land your dismount on bars and beam, or after you land your vault, a deduction of .1 is applied, up to .4. These steps on landing can add up and impact your all-around score. So stick your landing and improve your score! Smile!– If you smile and look like you are having fun, the judge will enjoy your routine. Also, judges evaluate each routine in the category of Artistry. By not smiling, you can earn a deduction of .1 in the Artistry category, “Quality of Expression’. This is an easy tip to nail, so Smile and have fun! Practice these tips and I hope you improve your gymnastics score! 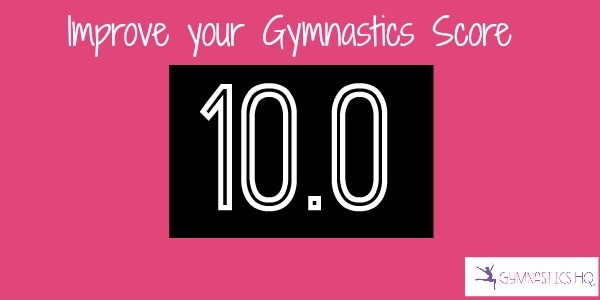 You might also be interested in 10 exercises you can do at home to improve your gymnastics skills and 9 basic gymnastics skills you should master. Well I am a level 10 gymnast, and oddly enough I had that same problem!!! Every day before bed lean agent a wall and hold a handstand for 1 to 3 minets! Trust me it helps!! I’m an Xcel Silver and we compete handstand-flat back for Vault. I have state meet this Friday, and whenever I go into the skill, I pike in the beginning and then go into handstand. Also, when I jump onto the springboard, I jump with my arms by my ears when I’m supposed to jump with my arms down. I’m also supposed to reach more, and idk how to do that since whenever i try to reach more, i always reach behind where im supposed to reach. sorry this was long lol.